PR: Pirina is a real Bulgarian name? Tell us a story behind it! from a small town called Razlog, it’s a ski resort in southwestern Bulgaria. South of Razlog raises Pirin - a beautiful mountain named after the Slavic god Perun. So I guess my name is a homage to my origins. 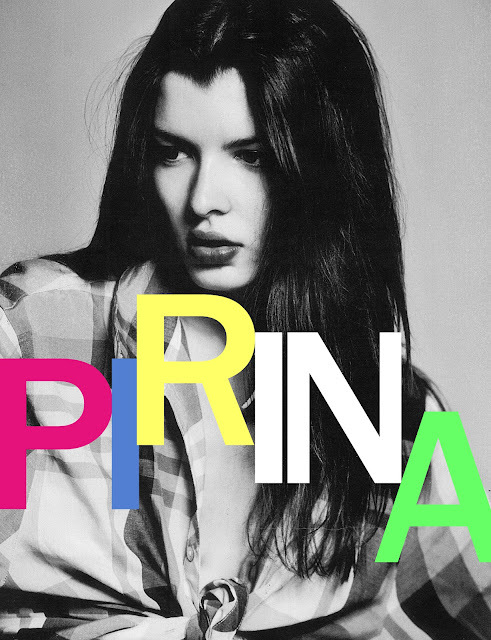 And my grandmother of course, her name is also Pirina. When I was little the kids from my school used to make fun of me and call me with other mountains’ names haha :). I didn’t like my name back then. But now I definitely love it! It’s just so unique and... Bulgarian. PR: How were you scouted? PIRINA DZHUPANOVA: I was scouted by my agency in Bulgaria. PR: Is anyone from your school, as far as you know, modeling too? a great model! We lost contact for a while but then started to be close again thanks to modeling. I have a hard time socializing with models, so it’s nice to meet up with some old friends. PR: Speaking about your school… You were in the same school as son of Bulgarian President?!? Do you ever felt nostalgic looking back at your past ? PIRINA DZHUPANOVA: Oh no! Not at all! I love love love my life right now! PR: As someone who has the best education background… what do you think about modeling world? PIRINA DZHUPANOVA: I have always been sкeptical about the modeling world. I come from a family of all doctors so it was really hard for me to accept myself as a model. Studying was always my priority and it was hard to manage both. My Bulgarian agency wanted to scout me when I was 15 or something, but I preferred to finish my studies first so I said no. My booker always makes this joke that destiny knows its way and that in the end fate brought me to them! And it’s true, I totally love my job right now, absolutely devoted to it. And to my design work of course. I got to have a project. Always. PR: What was your favorite experiеnce so far as a model? it, no matter if it’s a shooting for an important magazine or just a portfolio test. But I loved that moment when Naomi Campbell took me by the hand at her 25th Anniversary Charity Event at Dolce&Gabbana in Milan. Precious seconds. PR: How long have you been in Paris right now? felt lonely I was going to Champ de Mars and just stare at the Eiffel Tower. It was magic! My favorite place in Paris though is “Le Marais”, it makes me feel like I’m home and Place des Vosges it’s simply beautiful. In the end I don’t really get homesick, I just miss the people I love. And my cat. PR: Which one do you enjoy more: ballet or modern dance? PIRINA DZHUPANOVA: For sure modern dance fits my personality better! PR: Did you sign up in dance class in Paris? PIRINA DZHUPANOVA: I really didn’t have time for that. I was doing my castings during daytime and my textile prints in the evening. I sign up for some french lessons as well. So I found myself doing my abdominal crunches on the floor surrounded by 10 pairs of heels. PR: Do you stay in shape by dancing or you have to do some extra gym activities? PIRINA DZHUPANOVA: Going to dance classes was my obsession during highs chool but when I left home it was hard to keep up. I replaced dancing with kickboxing a couple of years ago, it’s totally my kind of training! The thing is you have to be stable and in one place, otherwise it’s impossible to go to classes. PR: How do you start your day, what is your usual breakfast? PR: What is your diet philosophy? PIRINA DZHUPANOVA: It’s funny, I love to google things like “world’s healthiest foods” or “top beauty foods”, make a list and then go to the supermarket and search for them! My diet philosophy is very important to me and it’s related to my life philosophy. I love natural things and I believe you have to keep your mind, body and soul in harmony (not that I succeed, but I do try). good option but for me it was just easier to quit. So one of my favorite healthy and lovelytasting foods are sweet potatoes, quinoa, all kind of berries, seaweed, soy products, honey and I just can’t quit sushi! I drink plenty of water and tea. Kusmi Tea in Paris, the best tea store ever, you should try the Algotea! PR: How can you resist all those pastry shops in Paris?!? PIRINA DZHUPANOVA: There is one thing I cannot resist in Paris: the croissant, mythical! Every now and then my favorite thing is to eat three in a row, because one is just not enough! Macaroons have the Parisian spirit, but I prefer a baguette. PR: Let's speak about your style! PIRINA DZHUPANOVA: I was recently told that I look like a “Russian soldier”. One of the best compliments ever! So I think “strong personality” would have to be my style. I love the combination of skinny legs + army boots + leather jacket, you know, the usual deal. Black is for sure my color for clothing. I also love to wear baggy mens sweatpants, but of course you can’t go to castings like that :) . If I wear a dress it has to be short and if I wear heels they have to be really high because I don’t like the in-betweens, everything has to be to the max in my life. PR: Did you went crazy with shopping when you arrived in Paris ? PIRINA DZHUPANOVA: I didn’t went crazy with shopping in Paris but I did buy a pair of black boots from San Marina (I just walked into the store, I have never heard of it before) a fake fur coat from Zara which me and my friends call the “Yeti” and a simple but really nice black winter coat, Zara again. Just the things I needed, that’s all. PR: What's the last piece of clothing you bought? PIRINA DZHUPANOVA: My sister came to visit me in Paris and we both got this scarf with the American flag. It’s really nice but I’m not putting it on before going to New York! PR: What is your favorite pair of jeans? PIRINA DZHUPANOVA: Can I say Primark? They have the best 9 pound skinny jeans ever! And you just don’t care if you cut them after, I love to do that. PIRINA DZHUPANOVA: The San Marina black boots I bought. Oh I’m in love with my casting heels - 14cm high, obviously black and from Zara again. PR: Espadrilles or flip flops for this summer? PIRINA DZHUPANOVA: I usually go with sandals but from these two above I’d choose flip flops! PR: You have a gorgeous hair. You've never dyed it, have you? PIRINA DZHUPANOVA: Thank you, that’s sweet :) Actually I have dyed it twice as a teenager. One time red and one time black, but I used henna so it wasn’t that harmful. Oh and I did have this hair job once in Barcelona, they dyed my hair black but it washed out in a couple of months. Now it’s all natural and I love it! I have to trim more often, like every two months. My favourite shampoo is Denise Line by BioPharma, it’s made in Italy and I buy it in Bulgaria for like 2 euros. When you travel though your hair reacts differently to the water you are washing it with. In Paris I had to buy products for dry hair, because the water there was a bit destructive for my hair. I chose Klorane. I also have a favorite hair mask that I love to do when I have some free time. It’s made of ricin oil, liquid vitamin A, egg yolks, yogurt and vodka. It works like magic! PR: How do you maintain your skin? PIRINA DZHUPANOVA: I use URIAGE Hyséac moisturizer, tonic and gel. I don’t have a favorite eye makeup remover, currently it’s Neutrogena. I think the SPF it’s really important to maintain a healthy and good-looking skin. PR: Any beauty tips or secrets you've learned through modeling? PIRINA DZHUPANOVA: Not really. Just try to get enough sleep, move a lot and drink plenty of water! PR: Do Bulgarian women have special beauty secret or product that they swear by? PR: What are your makeup essentials? eyebrows with transparent mascara, sometimes curl my lashes and put some mascara on them. Every now and then I put a strong lipstick, the colors of Rouge Pur Coutureby YSL are favorites. PR: The beauty item that you couldn’t live without? PR: We know you like to draw… Did you visit all museums in Paris? PIRINA DZHUPANOVA: I went to Musée d’Orsay and saw some of my favorite paintings by Monet and Van Gogh. I already had visited the Louvre Museum some years ago so I was more interested in the exhibitions. Unfortunately I didn’t have much time for that, there were so many interesting things to see in Paris like the Balenciaga and Comme de Garçons exhibit or the Tim Burton exhibition (I love his movies!). I only managed to go to the Helmut Newton exhibition at Grand Palais and it was amazing! PIRINA DZHUPANOVA: I don’t have a favorite artist, but you should check Sara Ligari, she’s a great fashion illustrator. PR: What music do you listen ATM? PIRINA DZHUPANOVA: I’m obsessed with this song, it’s called Brutal Hearts by Bedouin Soundclash feat. Coeur De Pirate. PR: What is the most surprising song on your MP3 at the moment? PIRINA DZHUPANOVA: I guess all songs of Francoise Hardy. PR: Are you looking forward to NY? PIRINA DZHUPANOVA: You have no idea! I have already packed my bunny ears!